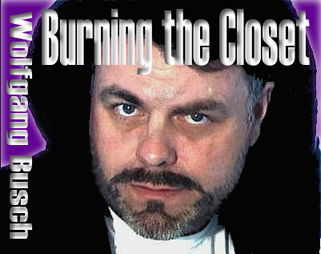 Burning the Closet with Wolfgang Busch is your spot for politics, media, health, arts and culture from a Gay perspective. The focus is the less publicized community issues the mainstream media has ignored and/or overlooked. It was a very unfortunate experience for me that I was on public assistance for about 2 years after 9/11 and learned much about how the General Welfare committee, chaired by Mr. Bill de Blasio runs its programs. Mar 17 2009 How Do I look Report from Mar 17th, 2009 by "Terence & Kevin"
In the House was Grammy nominated artist JANID ("Twisted"), Mashala, The House of Ninja (Benny, Richard, Javier, Milton) and a host of other notables from the Ballroom. It was a packed house and very diverse. I thought to myself, I wonder why more of the stars of the movie don't come out to these screenings and why these same people don't support Wolfgang by at least coming out to show some love? Apr 10 2006 Waiting for Justice and Effective HIV/AIDS Prevention Programs for the "Ball Community". In NYC many AIDS Organizations have lost the connection of Effective HIV/AIDS Prevention Programs to educate the "Ball Community", a Black and Hispanic LGBT artistic community at Risk. The Ball Community was introduced to the public by Madonna's music video "Vogue", "Truth or Dare", "How do I Look" and "Paris is Burning". The "Ball" community had the opportunity since July to review the limited How Do I Look DVD edition, distributed by Art From The Heart LLC. (not the official release yet) and I would like to take this opportunity to address some of the issues, so we all have a better understanding of the purpose and mission of HDIL and what it represents for the "Ball" community.